Boost the reliability of your connectivity by snapping up one of the best USB Wi-Fi adapters. 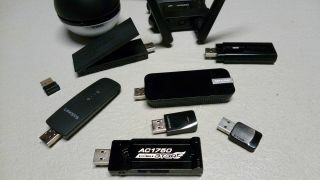 Straight out the box some standard integrated Wi-Fi adapters you get with PCs or laptops can often become dated quickly. Immediately, almost. However, there can be a simple cure to this: often much-maligned but still useful, adding one of the best USB Wi-Fi adapters can get you out of a hole. I recently tried to rebuild an old PC and was incredibly pleased to pick up a USB Wi-Fi adapter then to ensure I had connectivity in my (ultimately futile) quest. Such is their quality nowadays, that reliable connectivity, even boosts to it, can come in a range of small and simple, plug-and-go solutions. We’ve herded up some of the best USB Wi-Fi adapters here, all from some of the major manufacturers. For reference, we test the performance of the adapters using NetPerf software at three distances on the 2.4 GHz and 5 GHz frequencies. Based on the results from those tests, these are our picks for the best USB Wi-Fi adapters you can get right. There are nano adapters at the tiny end of the scale, and at the opposite end is the Trendnet TEW-809UB. This networking device tosses portability out the window, for faster AC1900 (N600, AC1300) speeds and serious antennas. You can count ‘em as there are no less than four external antennas, all positionable with a strength of 5 dBi each. There is only a driver provided, but no software. Rather, Windows is in control of the networking duties. The adapter does not support MU-MIMO, but does support Beamforming. In use, the Trendnet TEW-809UB is rock stable and fast. It retails for $109, with a street price on Amazon of $79. It puts its antennas to good use, beating every other adapter tested on our new wireless fringe location testing—on both the 2.4 GHz and 5 GHz bands. For using Wi-Fi in a challenging situation with a poor signal, this is the adapter to go with. The Asus USB-AC68 adapter features a novel folding design that incorporates dual deployable antennas. It includes a USB 3.0 connection, the AC1900 standard, Asus AiRadar Beamforming, and MU-MIMO via a 3x4 antenna design. The results are a bit of a mixed bag as this Asus adapter lags in the 2.4 GHz tests at both distances. While the 5 GHz tests are much stronger, it still wasn't the fastest at either the close or far distance tested. While the Trendnet TEW-809UB is our favorite Wi-Fi adapter for its performance and range, it isn't exactly the most compact or portable solution. For those who are hoping to use their adapter for gaming on the road, the Asus USB-AC68 is a much better choice with its street price of $75. The adapter includes a cradle for use at home but can be plugged directly into a USB port for easy travel. The Edimax EW-7833UAC is the update to our previous budget adapter pick, the EW-7822UAC. While many mainstream adapters suffice with AC1200 specs, this Edimax EW-7833UAC takes it a notch up with AC1750 speeds (N450, AC1300). Installation was simple, with Windows 10 managing the settings. While it is similar in size to other mainstream adapters, it cleverly features a small deployable piece that contains three antennas to increase range and throughput, along with support for both MU-MIMO and Beamforming technology. The EW-7833UAC smoked the competition, with class leading throughput on four of the six tests, which included both the 2.4 GHz and 5 GHz frequencies. We came away particularly impressed on the close 5 GHz test of 298.9 Mbps, much faster than some other respectable adapters could muster. The only real weakness was on the far tests where this adapter gave up a little ground to the competition. Perhaps the best part is that the street price of this adapter is $34 making these kinds of speeds affordable for all. The Linksys WUSB6100M gets termed “micro” by the Linksys folks, and is quite small. It offers AC600 speeds, of N150, and AC433 Mbps. Even with the diminutive size, it supports the latest technology for wireless adapters, including MU-MIMO and Beamforming. This tiny device balances its small size against more than decent range and throughput. While the AC600 spec does limit the 2.4 GHz scores, the speeds on 5 GHz, even on the longer distance tests, bring home the win for throughput on three of the six tests for this increasingly competitive category of adapter. The longer distance tests for this adapter are even more impressive when you compare it against its class competition that fall short in the wireless fringe testing. The street price of $30 makes the Linksys WUSB6100M a great choice for an adapter to toss in a bag with your notebook or to carry as a backup. While many of us want to drive a Porsche or Ferrari, more of us end up driving Honda Civics or Toyota Corollas. For those that want the bargain basement of a USB wireless adapter, we recommend the Trendnet TEW-805UB, the little brother to our best full size adapter pick, the Trendnet TEW-809UB. This Trendnet adapter is sized just right—compact, while not so easy to lose. The textured outer surface also effectively keeps it from getting all smudged. While it did not win any crowns on throughput, it still had solid speeds across the board, except for the 2.4 GHz fringe test, but recall that we originally started using this location to test extenders as in a Wi-Fi deadspot, this Trendnet adapter still managed 61.5 Mbps of throughput, and all of its other scores were quite a bit higher. Testing was done for throughput using NetPerf software. A desktop with a Gigabit Ethernet port (10/100/1000) is used to send the data via a wired connection to the router. Three test runs were done on each wireless adapter at each of the 2.4 GHz and 5 GHz frequencies, at three distances: close, far and fringe, with the highest throughput of each parameter reported. The router used is the Asus AC1900P, our choice for the Best Budget Gaming Router. The throughput is tested at a “close” 8’ (2.4m) distance with direct line of sight, and also at a “far” 30’ (9.1m) distance with an obstructing floor and wall in the way, as well as some metal ductwork intervening. For this revision, we added tests in a Wi-Fi “fringe” location, that we started using for our Best Wireless Extender Buying Guide, except we did not plug in an extender to make the wireless connection more challenging for the wireless adapter and to test their antennas.